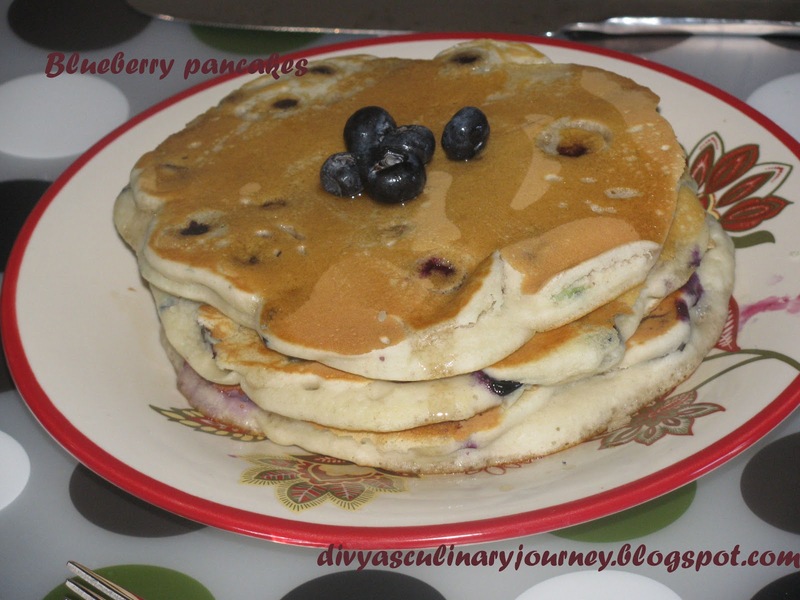 Today I am sharing here, Blueberry Pancakes recipe. These are soft and fluffy pancakes made with blueberries from scratch. When first I heard about pancakes, I made my trial with the box mix. I still remember the day when I got the box mix- I was not even sure how it will taste- may be like sweet dosa? ?, but why does it requires egg?? where the questions that were going on in my head. But when it came out light and fluffy, immediately it became one of my favourite dish. Then when Hubby and Thaara showed interest in them too, started to make them every week. So Sunday is pancake day.They have become a part of our sunday tradition. I once saw Cake boss, Buddy make pancake for his TV show- kitchen boss, that is when I started to make it from scratch. Sometimes as per Thaara's request, will make different shapes for her. Out of excitement, she will finish her breakfast in fraction of seconds. Still there were few blueberries left after making muffin, so when the pancake time came, they became the key ingredient. Pancake came out really well. Seperate the egg whites from the egg and beat them till they are stiff and keep aside. In another bowl, mix together all dry ingredients- Flour, baking powder, sugar, salt. To the dry ingredients add milk and melted butter, then add the prepared egg whites, mix in till you form a homogenous mixture. Then fold in the blueberries. Heat the griddle. Pour a laddle full of pancake batter and then drizzle some butter. cook for a minute then turn to the other side and cook till its done. Divya.. this has not been linked.. can u please re-link it again! Nice pancakes Divya, today I enrolled myself in the Wilton Basic Cake Decorating class, I read about it here only..
Thats nice Hema.. You will learn all a lot in the class. It will be fun too. Lovely pancakes! I'm tagging you now. Thanks for dropping by in our recp. blog and happy to follow your blog ..delicious pancake ..
Blue berries taste delicious in pancakes and muffins. Pancakes look awesome! Nice recipe!